SAN ANTONIO — Excited. Honored. Joyful. That’s how 40 delegates from the Diocese of Fort Worth described their participation in the V Encuentro Region X Conference held April 13-15 in San Antonio. Culminating years of preparation in parishes and dioceses, the regional event brought together 800 lay ministers, parishioners, religious women, and clergy from Arkansas, Oklahoma, and Texas for one purpose: to improve the quality of ministry to Hispanic/Latino Catholics so they become more engaged in the life of the Church. During a process that involved reviewing ideas and suggestions culled from working documents submitted by 18 dioceses in Region X, delegates were assigned to small groups where the conversation was limited to one ministerial area. Focusing their discussions on areas such as evangelization and mission, stewardship, faith formation, family life, immigration, and more, participants prioritized recommendations and strategies to best serve Hispanic and Latino Catholics. V Encuentro is an initiative of the U.S. Catholic bishops who want to respond and reach out to the growing number of Hispanics in the country — especially the young and those living on the periphery of society. Efforts made at the diocesan and regional level will lead up to the V National Encuentro gathering, hosted by the Diocese of Fort Worth from Sept. 20-23 in Grapevine. Previous Encuentros took place in 1972, 1977, 1985, and 2000. The goal of V Encuentro is to discern ways the U.S. Catholic Church can better respond to the presence of Hispanics and Latinos and strengthen ways they can respond to the New Evangelization call for missionary disciples serving the entire Church. Bishop Michael Olson took time during his busy weekend to meet with Fort Worth’s Encuentro delegates for a frank and intimate dialogue about vocations, young adult ministry, and other concerns affecting Hispanic parishioners. Olivia Olvera appreciated the personalized attention the group received from the bishop. Members of the Hispanic community support the bishop and know he’s working on their issues. A procession of representatives from every diocese in Texas, Oklahoma, and Arkansas, led by the Cross of the Encuentros, welcomed delegates to the opening of the Region X gathering. Blessed by Pope Francis, the oak cross bears the inscription “Hispanic People: Joyful Disciples in Mission” and is engraved with thorns and resurrection lilies. It symbolizes the faith journey of Hispanic and Latino Catholics in the U.S. over the past 50 years. Current U.S. census estimates show Hispanics are the fastest growing ethnic population in the country with about 29.7 million Hispanic Latinos identifying as Catholics. Sixty percent of American Catholics under the age of 18 are also of Hispanic descent. Designated Episcopal Moderator for Region X, Bishop Vasquez asked the audience to remember Encuentro is a three-step process of evangelization, communion, and consultation. “The process of consultation requires us to be open and listen to many people — those actively involved in the Church and those distanced from the Church,” he said, noting the importance of two particular groups. Bishop Vasquez advised delegates to recognize the hopes and dreams of young people and reach out to immigrants and “Dreamers” — those young adults brought to the U.S. as children without documentation. The bishop’s words resonated with Gemma Ramirez. While preparing children for Reconciliation and first Communion, the St. Elizabeth Ann Seton parishioner often encounters parents who don’t speak English. “It’s a big church with a smaller (Hispanic) community who needs attention,” the catechist said, referring to the Keller parish. Families seeking faith formation for their youngsters may face a language barrier or have other obstacles like economic hardship or an absent father. Even a little gesture can make a big difference. “Sometimes those people don’t feel welcomed so even hearing ‘buenos dias’ from the pastor makes them feel better,” Ramirez added. A member of Pastoral Juvenil Hispana in the Diocese of Fort Worth, Daisy Gaytan was part of a roundtable discussion on the best way the Church can serve young people from different ethnic groups. 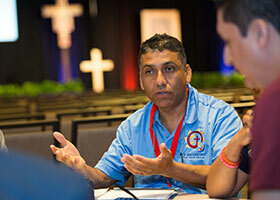 Joel Rodriguez, director of Hispanic Ministry, called the regional V Encuentro a success for the Fort Worth team. Delegates were well-prepared and productive representatives of the diocese. 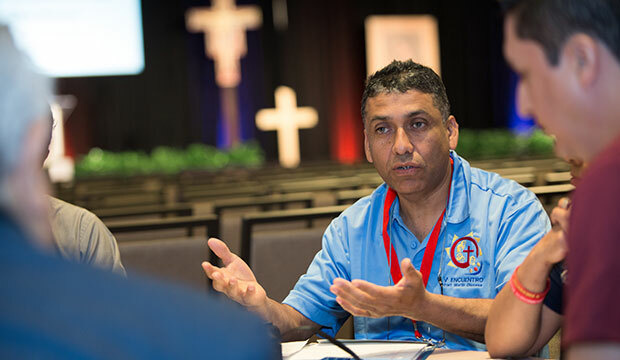 The 3,000 delegates expected at the V National Encuentro in Grapevine will review the recommendations submitted by the regional delegations then publish a working document outlining the pastoral priorities and strategies appropriate to the present time. “They are ready to go out, take this experience, and tell other people about it,” she continued. “They want to go into their parishes and start doing the work. SAN ANTONIO — Excited. Honored. Joyful. That’s how 40 delegates from the Diocese of Fort Worth described their participation in the V Encuentro Region X Conference held April 13-15 in San Antonio.